Best stay ever! Super nice host, clean room clean bed, spacious common area! I will definitely go back to visit this place again! What a spectacular hostel! 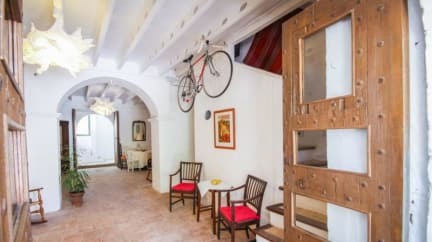 Beautiful location, wonderful Spanish tiles and decorations in the (very clean) kitchen. Great staff, very helpful! I had amazing time !!! I stayed for 1 week and I could stay even longer if I could! The bautiful garden and the view in the mountains give a very nice feeling. I was the only guest at the beginning, the last 3 days were many people who are doing the GR221 a hiking trail through the Tramuntana Mountains. I got to meet many beautiful people and the very cute Terra the dog of the family! Jose the owner of the place is a lovely person, helping with anything even a ride to the airport. 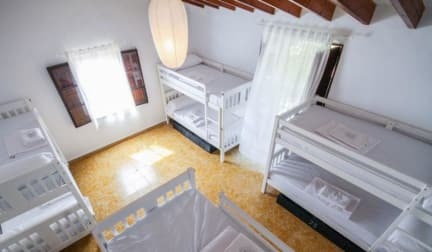 Sa Fita is the best hostel experience I have ever had (and I've stayed in a lot)! Where to begin? Marta and Juan are so friendly, generous and are excellent at answering questions and helping with directions and local advice! Sa Fita is a big home with many different places to sit and relax, especially the garden that is beautiful and peaceful. You can see they take lots of pride in keeping it very clean and making it a great experience for all guests! Can't wait to go back to Sa Fita!! I only stayed for two nights, but everything went great. The staff was very welcoming, they had plenty of resources, and the facilities were very well maintained. The view from the room was amazing also. I did have a bit of an issue with Mosquitoes, so be prepared! Hands down one of the best hostels we ever stayed at! We had a blast during our stay and were treated lovely by the owners. Highly recommend staying here. Sa Fita was a the perfect place to stay. Friendly and incredibly helpful staff, clean spaces, beautiful design and a very cozy atmosphere. There were no lockers but I don't feel I needed to lock my stuff. I had a great time at Sa fita backpackers! Travelers who stay at this hostel have the benefit of being hosted by one of the most attentive hostel owners I’ve ever known in Marta. She stays at the same house so she somehow has the ability to maintain the property and her incredible personal garden (which guests are free to explore) in the backyard. WiFi is a little flakey, and I’d rather not have to post to Facebook each time I connect, but the connection was fast and the facilities are great. Absolutely fantastic hostel, was quiet when I went out of season, but the owners are really lovely! Smiles all around! They allowed me to keep my bicycle in the garage, and even pumped my tyres up the following morning for me! Fully equipped kitchen, extremely clean rooms and beautiful garden and swimming pool. Little slice of paradise in the wonderful mountain town of Esporles. Make sure you stay here!